(12) The Lord's body complete with ornaments and weapons cannot be seen materially but for the divine purpose it was manifested by Him acting like an actor in a theater and could be seen in the form of a dwarf boy [Vâmana]. (13) Seeing Him as a brahmacârî dwarf made the great rishis very happy and thus they performed, with the founding father Kas'yapa as their lead, all the ceremonies [like the jâta-karma birthday ceremony]. (14) At His sacred thread ceremony the sun god chanted the Gâyatrî mantra [see note** at 5.7], Brihaspati gave the sacred thread and Kas'yapa offered Him a belt [of straw, signifying the twice-born status]. (15) Mother earth offered Him a deerskin, the moon god ruling the forest gave Him a staff, Aditi gave Him underwear to cover His body and from the ruler of heaven [Indra] the master of the universe He received a parasol. (16) The Knower Inside [Brahmâ] gave a waterpot, the seven sages donated kus'a grass and the goddess Sarasvatî gave the Imperishable Soul a string of rudrâksha beads, oh King. (17) Thus having received His sacred thread, the Ruler of the Yakshas [Kuvera, the treasurer of heaven] delivered a pot for begging alms and Umâ, the chaste mother of the universe, the wife of S'iva, personally provided the alms. (18) He as a brahmacârî thus being welcomed by everyone, outshone with his brahmin effulgence as the best of them the entire assembly that enjoyed the grace of all the great brahmin sages. (19) After kindling a fire as should, He like the best of the brahmins strew [the kus'a grass] around it and fed the fire of worship with wood. Third revised edition, loaded September 13, 2012. S'rî S'uka said: 'The Eternal Being, He with the conch, the club, the lotus and the disc in His four hands, the yellow dress and the lotus petal eyes, He whose heroic acts are praised by Brahmâ, consequently manifested Himself from Aditi. He with a pure, blackish complexion, the luster of two earrings in the form of sharks and a dazzling lotus face, was the Supreme Personality marked by the S'rîvatsa mark on His chest and wearing bracelets and armlets, a shining helmet, a belt, a sacred thread and charming ankle bells. With a swarm of sweetness seeking humming bees around Him and carrying an extraordinarily beautiful flower garland and the Kaustubha gem around His neck, the Lord vanquished the darkness of Kas'yapa's house with His effulgence. At that moment everywhere one was filled with happiness, all living beings in the waters, in the mountains, in the higher worlds, in outer space and on earth. There was the full quality of each season and all the cows, the tongues of the fire and the twice-born ones were at their best. When the Lord took His birth it was a most auspicious moment: all the planets and stars, the sun and moon stood in a favorable position. It happened on Dvâdas'î [the twelfth day of the bright fortnight of Bhâdra] at noon [Abhijit] when the moon was in the house of S'ravana. Oh King, this exact moment of the appearance of the Lord at Dvâdas'î with the sun over the meridian, is the day the scholars call Vijayâ. The loud sounds of the different conches, drums, kettledrums, panavas, ânakas [other drums] and other instruments that were vibrated, became a great tumult. The heavenly dancing girls danced blissfully, the leading celestial singers sang and the sages, the demigods, the fathers of mankind, the ancestors and the fire gods all pleased the Lord with prayers. The perfected ones, the ones of knowledge, the apelike ones [the warriors of Râma], the ones of superpower, the venerable ones, the treasure keepers, the benevolent ones, the reciters [the 'brothers of Garuda'], the greatest experts [the 'snakes'] and all the followers of the demigods, glorifying, dancing and praising covered the residence of Aditi with flow [compare 6.7: 2-8 and 5.5: 21-22]. The Lord's body complete with ornaments and weapons cannot be seen materially but for the divine purpose it was manifested by Him acting like an actor in a theater and could be seen in the form of a dwarf boy [Vâmana]. Seeing Him as a brahmacârî dwarf made the great rishis very happy and thus they performed, with the founding father Kas'yapa as their lead, all the ceremonies [like the jâta-karma birthday ceremony]. At His sacred thread ceremony the sun god chanted the Gâyatrî mantra [see note** at 5.7], Brihaspati gave the sacred thread and Kas'yapa offered Him a belt [of straw, signifying the twice-born status]. Mother earth offered Him a deerskin, the moon god ruling the forest gave Him a staff, Aditi gave Him underwear to cover His body and from the ruler of heaven [Indra] the master of the universe He received a parasol. The Knower Inside [Brahmâ] gave a waterpot, the seven sages donated kus'a grass and the goddess Sarasvatî gave the Imperishable Soul a string of rudrâksha beads, oh King. Thus having received His sacred thread, the Ruler of the Yakshas [Kuvera, the treasurer of heaven] delivered a pot for begging alms and Umâ, the chaste mother of the universe, the wife of S'iva, personally provided the alms. He as a brahmacârî thus being welcomed by everyone, outshone with his brahmin effulgence as the best of them the entire assembly that enjoyed the grace of all the great brahmin sages. After kindling a fire as should, He like the best of the brahmins strew [the kus'a grass] around it and fed the fire of worship with wood. As soon as He heard about the glory of Bali as someone who under the guidance of Bhrigu brahmins performs horse sacrifices, He headed for the location where they took place and with each step that He as the Complete and Fully Endowed Essence made on His way, He therewith imprinted the earth with His footsteps. At the northern bank of the Narmadâ river in the field of Bhrigukaccha where all the priests of Bhrigu were performing their rituals for the sake of the ultimate ceremony [the horse sacrifice], they saw Him in their presence [radiating] like the risen sun. The priests as also Bali, the instigator of the yajña and all who had assembled there, were overshadowed by Lord Vâmana's splendor, oh King and wondered whether they saw the sun rising, the god of fire or Sanat-kumâra who wanted to attend their ceremony. While the Bhrigus thus with their disciples were disputing in various ways, the Supreme Lord Vâmana with in His hands His umbrella, rod and kamandalu filled with water, entered the arena of the As'vamedha sacrifice. 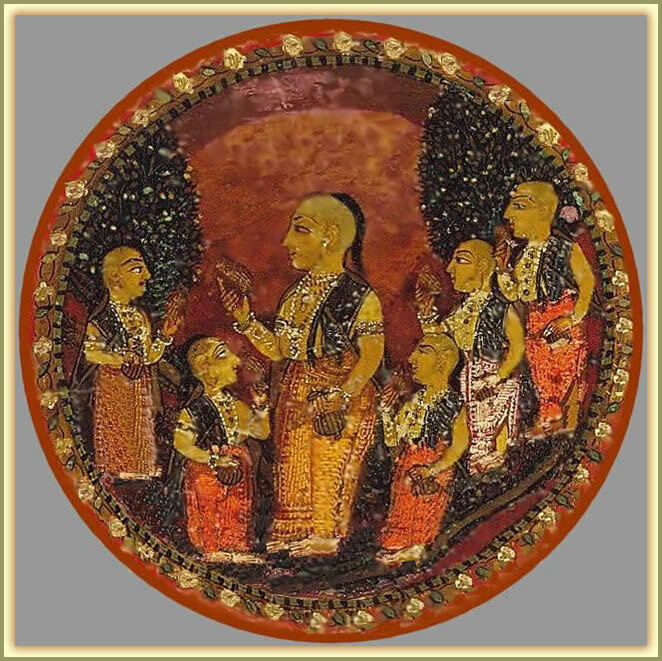 The moment Vâmana, the learned, seemingly human child that was the Lord, with His munja belt of straw and the sacred thread around His waist, His deerskin upper garment and His matted locks of hair, arrived there and was seen by the priests of Bhrigu with their disciples, they all stood up from their engagement in the fire sacrifice and appropriately welcomed the One who with His brilliance outshone them all. The instigator of the sacrifice, delighted to see Him so beautiful in each of His lustrous limbs, offered Him a seat. The Beauty of the Liberated Souls was thereupon with words of welcome worshiped by Bali Mahârâja who honored Him by washing His feet. S'rî Bali said: 'We welcome You. My obeisances unto You, oh brahmin. What can we do for You? Oh noble soul, in my opinion You are the austerity of the brahmin seers in person. The arrival of Your lordship today at our residence, satisfies all our forefathers, it purifies the entire family and completes the sacrifice we are performing now! Today oh brahmin son, my fires of sacrifice are properly served according to the injunctions. Oh, by the water that washed from Your lotus feet all my sins are destroyed and by Your small feet the earth is purified. Playing Card from a Dashavatara (Ten Avatars) Ganjifa Set, Mid-18th century. India, Maharashtra, Sawantwadi (? ), Source: LACMA.